There are so many reasons we love Scandinavian design, but its pure simplicity and beauty are high on the list. We've already gushed over "hygge" and stunning Swedish interior design, but this time we're looking outside. Scandinavian and Scandinavian-inspired architecture is all about clean lines, neutral materials and an overall sense of minimalism, and we simply cannot get enough. Like this simple-but-gorgeous black siding house from amandaciurdar, Swedish homes are understated in the very best way. They're also often designed to withstand the elements, whether that means keeping the cold out or the heat in. That's why we've rounded up even more gush-worthy Scandinavian homes you're sure to love. Scandinavian architecture as we now know it took off in the 1950s in Denmark, Finland, Iceland, Norway, and Sweden. 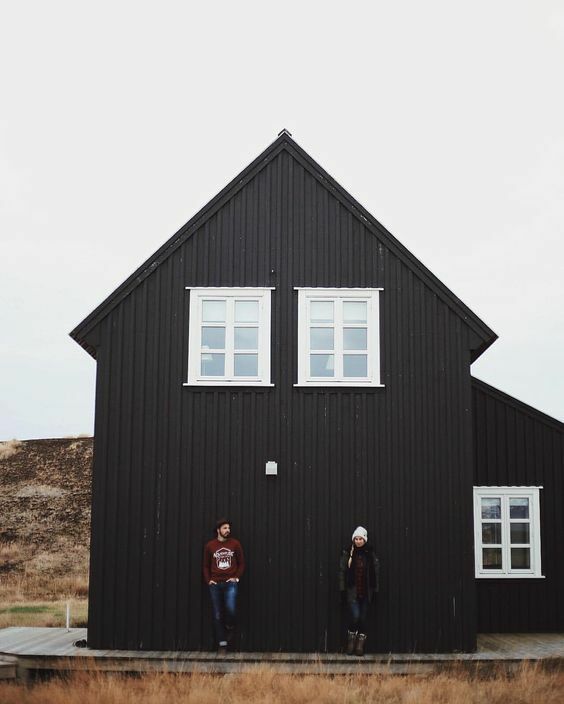 Stark contrasts, like this black and white home as seen on odetothings's Instagram page, are common in Nordic design. This architectural style is all about minimalism, but that doesn't mean you can't have a little fun with neutral colors. We love this sleek black siding when paired with a bright beam that really makes it pop. Another key element of Scandinavian exteriors is the use of nature in the design. This unique wooden home seen on ArchDaily looks like it's almost a part of the forest it sits in. Many Nordic architectural styles work to merge the home with the outside world, making you feel like you're never separated from nature. This cozy cabin actually looks incredibly spacious inside thanks to its strategic windows and siding. The lack of daylight for much of the year means Scandinavian homes embrace natural light when they have it. We love this wide-windowed home from HQ Room—it's actually located in Argentina, but embraces everything we love about Nordic exteriors. The huge paneled windows and the natural wood siding allow it to blend seamlessly into the surrounding trees. We love this Swedish home seen on Dwell for its use of wood all around its exterior. Because wood is affordable and plentiful in Sweden, it's widely used in construction. Though this exterior is understated, it's still inviting and warm. Each window is designed specifically for its corresponding room and helps give the home an open, airy feel. Who wouldn't want to while away the winter in this Swedish house? This stunning pool house by Lundberg Design is everything we dream of and more. 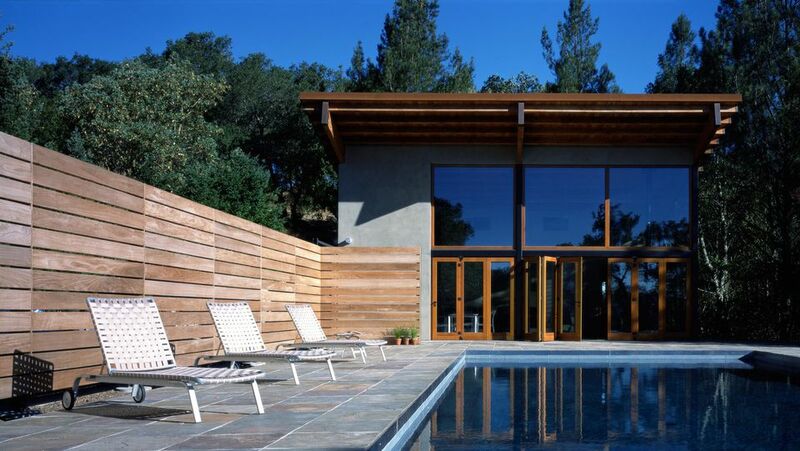 The raw, natural materials and expansive windows help to highlight the pool as a focal point. Copying this simple wood slatted fence is an easy way to get a bit of Nordic-inspired design into your own home. This eye-catching Reykjavik exterior seen on elliott_explores's Instagram is giving us serious color envy. If anyone can make corrugated steel look stylish, it's the Icelandic. This metal siding was originally thought to be a cheap, durable material to fight the harsh weather in Iceland, and it's become an archetypal element of Nordic design. We'll happily add a splash of bold color to our homes if they look as chic as this. Who says bigger is better? This tiny home by the sea in Stokkøya, Norway from asante has a small profile but big style. Like many Nordic homes, this cottage is built with wood and incorporates the surrounding natural setting. It's situated on rocks and overlooks the sea, making it feel more spacious and open. This stunning home on a cliff as seen on unitrenderspace definitely constitutes a "dream home" for us. Though it's mostly square, this wood-frame home is anything but boring. Again, it's built to with its environment in mind, and fits into the mountain it sits upon seamlessly. We can almost taste the hot, hygge-status tea brewing inside. By now you know that Scandinavian architecture is all about becoming one with nature, and what better way to feel like you live in nature than this window-filled cabin from Cabinporn? Built-in Gunnarskog, Sweden, even the gable roof has skylights to let the natural light in. Even the most minimalistic decorator can appreciate this inviting home from arnocornillon. The stark black is very Scandinavian-inspired, while the bright yellow door adds a bit of sunshine, even in the depths of winter. This upstate New York home is actually built from shipping containers, which gives it a metal siding look that feels authentically Nordic. Black homes are very popular in Scandinavian countries because the dark color absorbs light and helps to insulate the home against the coldest weather. We adore this stark black home as seen on appareilarchitecture; it's both practical and beautiful. The vertical lines on the facade as well as the roof add texture and visual appeal. Who doesn't love an A-frame home? These adorable sleeping quarters seen on retrovilla are the perfect guest bedroom. The black exterior is utterly Swedish—and though the space fits only a bed, it feels airy and open against the trees and greenery. Though this beautiful Norwegian wooden home from loggarkitekter is only a single story, the wall of glass windows helps it feel open and spacious. We love the simple natural facade, which feels modern and fresh. If you set foot in a Scandinavian country, you're sure to come across these deep red facades—as seen in this adorable country house from My Scandinavian Home. Red paint was once thought of a status symbol in Nordic countries and continues to be a defining exterior design choice today. If you're searching for paint inspiration, go bold like the Swedes and try some red. If this stunning cabin seen on upknorth doesn't make you want to pack your bags and move to a Scandinavian country, then we don't know what will. Even with the harsh winter outside, this all-wood home exudes warmth and looks oh-so-inviting. Another popular and durable material in Swedish homes is concrete, and this stunner seen on est_living's Instagram is proof that it can be truly beautiful. The stark black and white contrast, especially when paired with a water view, has an artfully modern edge. Add some oversized windows to let the outside in, and we're sold.